Either you’ve had a fireplace for a while, you recently moved into a house with one or just installed one in your current home and want to get up to speed with firewood storage. Whatever the case may be, you’ve come to the right place to find out how to store firewood. You might be thinking, “Is it really that big of a deal how I store my firewood?” The answer is very much yes. If your firewood is improperly stored, it’ll rot, become useless and you’ll end up spending a ton of money on new firewood. That’s where we come in. We’re here to teach you the do’s and don’ts of firewood storage so you can enjoy your fireplace all season long without spending a fortune on constantly replacing your firewood. Before you store your firewood, you have to prepare it first. Otherwise, you might be dealing with firewood that’s not quite ready to burn and which will inefficiently – causing you to buy more than you want to. If you plan on cutting your own firewood, there are a few things you need to keep in mind. In order to properly season your firewood so that it’s ready to burn when you need it, there are a couple of key guidelines to follow. Seasoning firewood is simply the process of gathering it beforehand and letting it dry out completely so that it burns as efficiently as possible. If you do this, remember to keep the firewood free of any moisture. You can achieve this by following the rest of our advice in this article. However, many homeowners don’t cut their own firewood and instead buy it in bulk when they’re ready to use their fireplace. 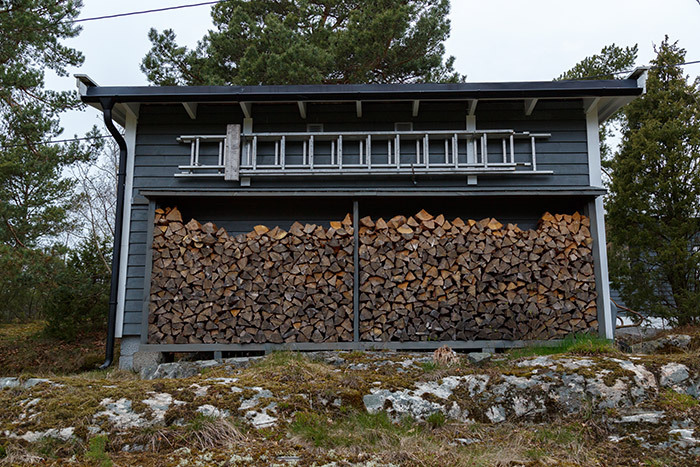 Another important factor to consider when storing firewood is how you stack it. It might not seem like a big deal, but stacking firewood properly is important for a couple of reasons. The biggest reason why you need to carefully stack your firewood is so that it gets adequate air circulation to help keep it dry. 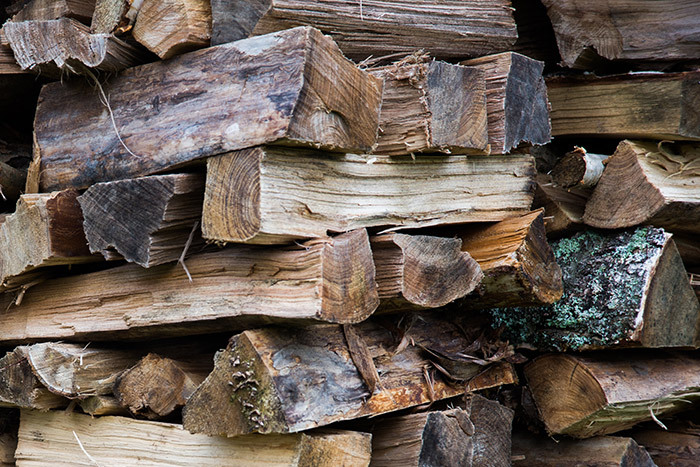 Air flow throughout your firewood pile is crucial because it helps prevent moisture from getting trapped within. It’s also important to be careful when stacking firewood so that you avoid an avalanche of it falling from where you have it stored. This is only a real threat to people that store their firewood in an open setting and not in a container of sorts that has walls or barriers to prevent spilling. Crisscross patterns and tapering are both solid ways to stack firewood as they provide airflow and protection against falling over. Now, we’ll go over what you need to know so you can store your firewood effectively and safely. As with every other aspect of your fireplace and chimney, you need to tend your firewood with excellent care. If you plan on storing your firewood outside, you absolutely must keep it off the ground. Leaving firewood on the ground outside will cause it to rot and decay at a high rate. Plus, it’ll increase the chance of mold growing on your firewood. The number one most important factor of firewood storage is keeping it dry. For those that want to keep the firewood indoors (already a smart choice), it’s still good to elevate it so that it doesn’t ruin the floor. 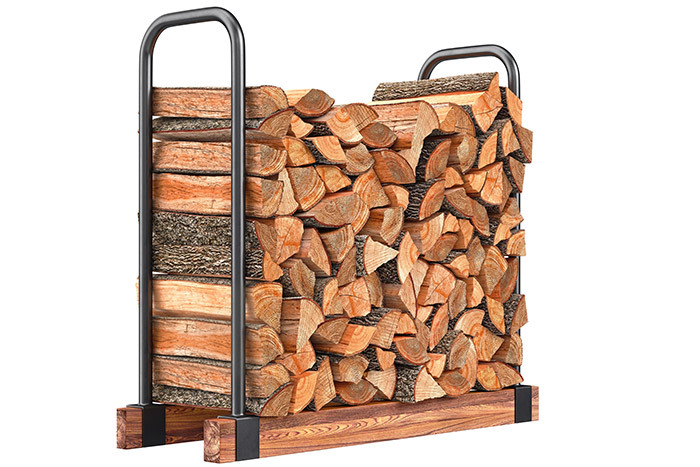 One of the most common ways to store firewood is to use a log carrier and a firewood rack. A log carrier is essentially a bag that the logs go into so they don’t make a mess. You can find them at any major department store. If you want to store your firewood outdoors, you’ll need to make sure that whatever you use to store it features a cover of sorts to keep rain away from the wood. Many people use big storage bins or simply a firewood rack with a tarp or heavy covering over it. There are also many DIY firewood storage ideas that can enhance the look of your home. Always remember, keep it off the ground and sheltered from rain and snow. How much you use your fireplace will determine how much firewood you need. However, if you don’t store your firewood properly, you’ll end up having to buy more because it can easily get ruined by moisture and pests. If you want to cut your own firewood, you must season it properly so that you can get the most out of it. For those that buy their firewood, make sure you keep it seasoned. There are many ways to store firewood and only you will be able to tell what’s best for your home. Whether it’s indoors, outdoors, in a rack or bin or something that you made yourself, you have to remember two things from this article – elevate the firewood and cover it. If you need any fireplace solutions such as replacement dampers, chimney cleanings, chimney liners or fireplace glass doors, Early Times is here. We’re Chicagoland’s fireplace experts and have been serving the area since 1985. Get a free quote online for any one of our chimney and fireplace services.